Often when we decide to do something creative, we look outside ourselves for an idea, something to start us off. But today I'd like to suggest we indulge in some navel gazing. Let's look inward for our inspiration. My Year Six students would be sniggering about now, thinking of organs and intestines! No, by inward, I mean let's look at who we are and what makes us tick. A prompt like this is a great one to do at the beginning of the year with a class, or any group you're just starting out with. This is something almost any age can do too. It's a great way to get people talking about themselves, expressing thoughts and feelings, and getting to know each other a little better. If you do it as a family activity, it can also be a wonderful way to get to know more about those we only thought we knew very well! Telling others about ourselves lends itself to collage, writing and poster making. Or maybe a hybrid of all three. 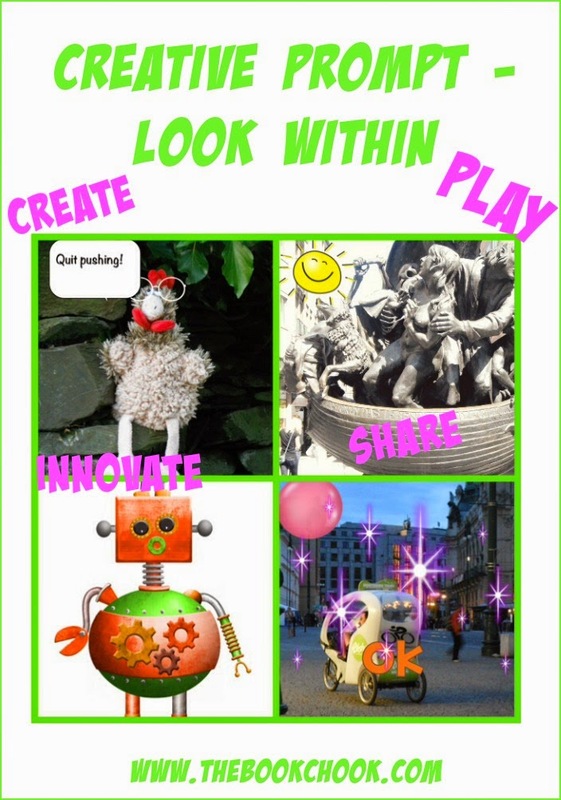 Supply kids with old magazines and they can choose pictures, captions and words that best represent themselves. But your children/students might choose to create a short movie, a wanted poster, a description in writing, a slideshow using photos and captions at PhotoPeach, a self-portrait in pastels or using an online art editor like Slimber, or perhaps a tool like Blabberize where they can simply talk about themselves. If they have trouble with choosing pictures and words, ask them questions to help eg what do you like to do for fun? can we find a picture of you/someone doing that? Help them to focus on favourite books and movies, foods and sports, holiday places and heroes - all things we usually like to talk about and share with others. I wanted to use an iPad app to create a collage of pics that represented different beliefs and quirks of mine. I've been experimenting with FrameArtist and decided to quickly add some images from my camera roll to a template. A little bling and I had a collage I could save and email to myself. I added words from my core beliefs at PicMonkey. You can see the collage at the bottom of my image, above. My article today is the eleventh in a series of prompts that I hope might spark some creative expression in your kids, and maybe you too. I hope you'll join me so we can all challenge ourselves to be more creative. You can catch the rest of the prompts at the first post in the series, by scrolling down to Update. It IS true that we often look outside of ourselves... I didn't think of it like that. Although, I always write my best when I connect with something inside... Even as a little girls I was like that. I was homeschooled in PNG for two years and I STRUGGLED so much in the writing department. The distant ed teacher said I just wouldn't be a good writer. My Mum sat with me one day -- I remember it -- and told me to just write about something I knew inside. Didn't my teacher get a surprise. I bet she never would have thought I would grow up to write pretty much everyday! And this is a point, and what I like what you've done with these prompts, everyone is able to write, they just need to find the right prompt... and a bit of practice. Great point Kelly - it's so much easier to write, (maybe to create in general?) when we have an emotional investment in something. With kids, I think one thing that helps is to build writing in to every single day, so to use the emotional angle, maybe a diary or journal is one answer. And I totally agree about writing as an adult - we can all do it, but it still takes study and hard work and passion to succeed and be published.